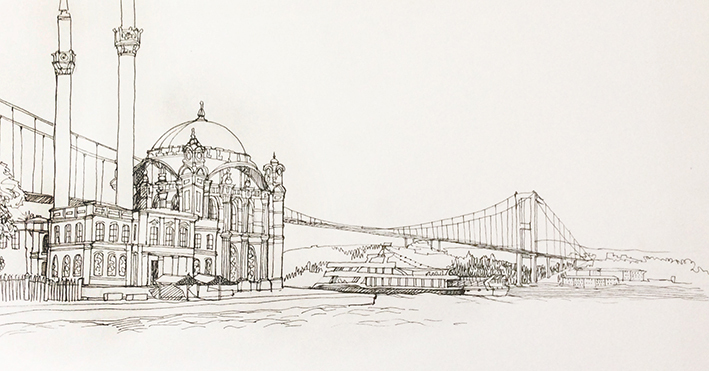 Last year in the long hot summer, before a nasty bout of shingles laid me low for a few months, I was commissioned to create a series of drawings of Istanbul. These would be used for the interior of a sketchbook, a prop which would feature in film director Ridley Scott’s latest commercial for Turkish Airlines titled ‘The Journey’. Ridley Scott, famous for films such as ‘Blade Runner’ and ‘Gladiator’, started his career in advertising and occasionally still directs commercials. They appear as short films, beautiful haikus of narrative that are often longer than the average ad – these versions are shown online if not on tv and cinema screens. ‘The Journey’, lasting around 6 minutes, shows a cat and mouse chase between two beautiful women in the historic Turkish city, Istanbul. It’s unclear who they are, although some undercover spy story is definitely suggested. They weave their way through the ancient buildings and baths of old Constantinople, one using the images in the lost sketchbook of the other to show her the way. The final scene shows their journey continuing by plane to Bali. Perhaps the cat and mouse chase never ends. Perhaps they never meet. My job was to draw multiple scenes of Istanbul buildings and people that featured in the plot, periodically dotting the tiny brown Moleskine book with quick sketches and leaving room for the designer to add notes and menus and postcards. 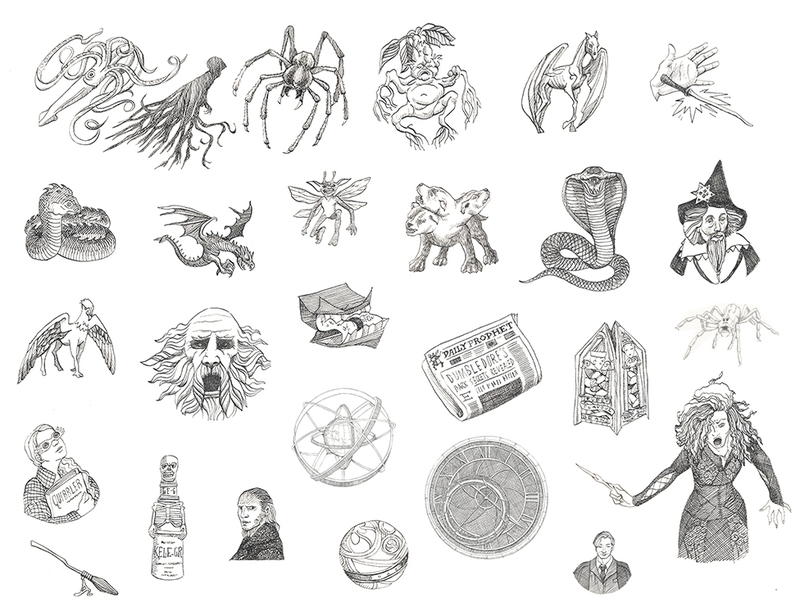 I was asked to make drawings naive – ‘like an art student but not as accomplished as a professional artist’. 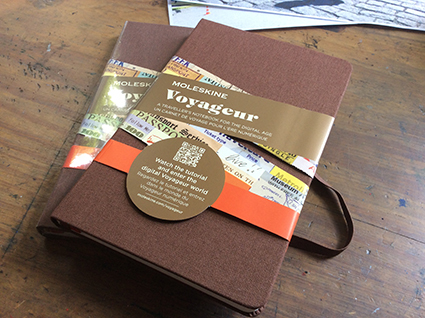 Things were left undone and unravelled, things were drawn over and over as they are in my real sketchbooks. The work was stimulating – skylines flashed with minarets; the port teamed with fishermen or leathery old boys selling feed for the flocks of pigeons; markets were busy with stalls and buildings of state were elegantly decorative. After working on it for a few days, the book was finally packaged up and sent off to the set in Istanbul and approval by the art director. At one point there had been talk of flying me out to sketch in situ but the heat would have made life difficult for me. Instead I’d made do with discovering the place and the people online, trying to forge a link with the mysterious sketcher without ever meeting her character. I was also asked to draw a portrait of the other main protagonist played by Sylvia Hoeks. Supplied with a number of headshots, you’d have thought this would be fairly straightforward. In reality, it needed some time with constant calls from Turkey requesting quicker and sketchier drawings – ‘Do it in three minutes….’, No! – a minute!’, ‘No!- 30 seconds!…’. The call goes dead and I rush back to my paper and scan and send again. There was an internal struggle between wanting to create a decent likeness in my own style and understanding that these were not ‘my’ drawings. In this case, the artist must become the actor and express another’s style and sensibility as the script requires. Like most film jobs, the illustrator employed by the design team, can never be sure if their work will make the final cut. Additionally, I was working alongside a second illustrator in Turkey, also producing sketches, so I didn’t know if anything of mine at all would appear until I actually saw the film itself. In the end, both of our work appears in equal measure. I like this – we have a strange bond, although I don’t know his name. He feels strange and mysterious. He must have been working away on sketching the city at the same time as me, perhaps drawing late into the sweltering night too. And perhaps this is at the heart of the story. Two people brought together by drawings in a sketchbook and a fascination with beautiful Istanbul and who, as the enigmatic plot of ‘The Journey’ suggests, will ultimately never meet…. ‘The Journey’ by Ridley Scott for Turkish Airlines appears in 30 second, 60 second and 6 minute versions and was premiered at the Superbowl on 3rd February 2019. I live in the seaside city of Brighton and Hove on the South Coast of England which has, for centuries, had a name for it’s creativity. 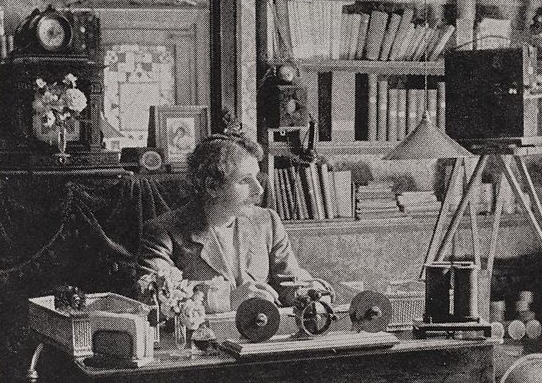 So it really should be no surprise that it was once a centre for English film making in those black and white days of the late 19th and early 20th centuries. 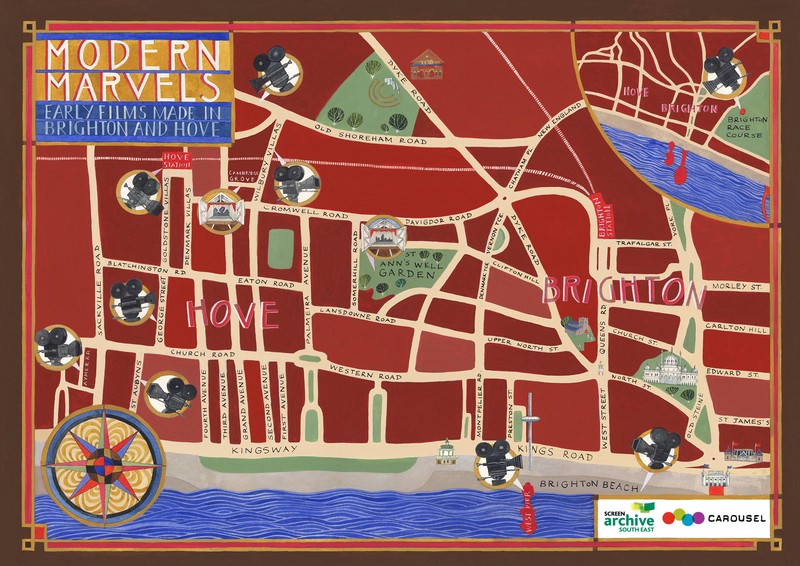 My latest map was commissioned by Carousel, an arts charity, as a special edition publication to promote ‘Modern Marvels’, a festival celebrating this cinematic heritage and new work by students with learning disabilities. 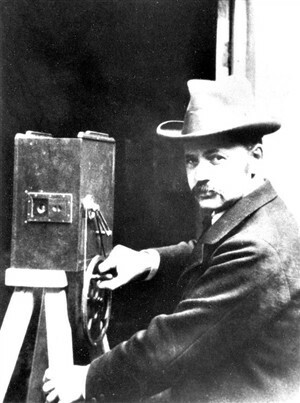 Early filmmakers, George Albert Smith and James Williamson lived in Hove, working on film between 1897 and 1905, a period when it developed as a new technology and a new form of entertainment. They both made important contributions to the art of editing and narrative. Was sleepy Hove, the Hollywood of it’s day? – I don’t know(!? ), but one of the first major film studios in Britain was based in St Anne’s Well Gardens there, a sedate park with tennis courts and a bowling green today. George Smith, a former stage hypnotist and psychic, created his ‘film factory’ in a glass house in the Gardens in 1897. Films were inspired by his experience of contemporary music hall, mesmerism and the magic lantern. They tell stories of steam trains, hapless housemaids and the wonders of X-rays using clever editing trickery. One of James Williamson’s first films was a short, made on location at Brighton’s West Pier in the hot summer of the late 1890’s showing bustling crowds enjoying the holiday atmosphere. He then developed Smith’s techniques into longer multi-shot narratives. Action films and comedy capers followed, all shot around the city or in his own studio in Cambridge Grove, also in Hove. The handpainted map shows the sites of both studios but also the film locations with tiny vintage camera icons. 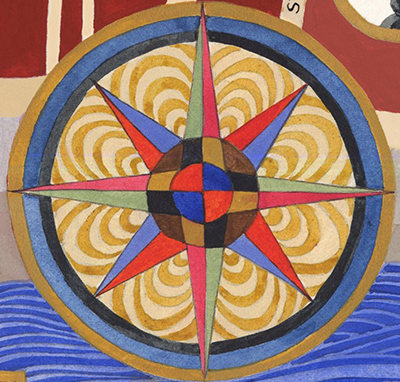 I gave the lettering, compass rose and border a hint of Art Nouveau, the predominant style at the time, and the negative space (the space between the details) became a cinema-velvet-curtain red. Carousel’s film festival, Modern Marvels, supported by the Heritage Lottery Fund, runs until November 2018. A travelling film booth shows the original black and white films alongside films made by students with learning disabilities, autism and additional needs. The project gave them an insight into film-making and visual story-telling, using green screen, making music and sound effects, working alongside experienced film-makers.